Yes, January is the time of year to make marmalade! The special Seville oranges you need to make this bitter sweet jam are only available this time of year. 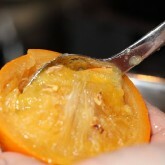 The Seville oranges are not fit for eating, they are very bitter and sour and contain very little juice. But a long time ago somebody found out they are perfect for marmalade. If you are going to make marmalade as a rule you will be busy for two days, but that’s half the fun. The kitchen smelling of citrus fruit while the jam slowly turns into this thick consistency. The thing we tuned down over the years is the amount of peel strips that go into the marmalade. These days we use the peel of 2 to 3 oranges, depending on their size. 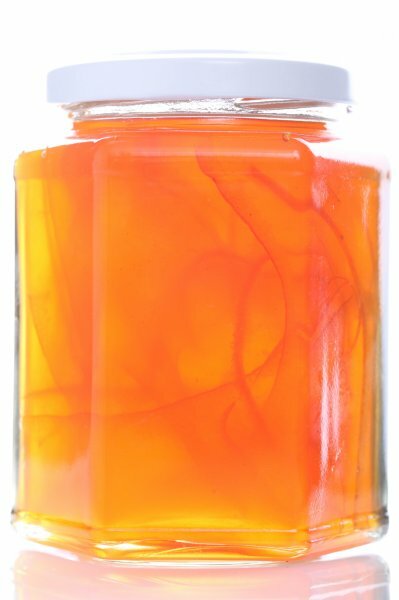 The result: a beautiful amber marmalade with enough peel to satisfy the people who love it and easy to steer clear of if you are less of a fan. March 2012 update We won a bronze medal at the Marmalade Awards. Very pleased with this result! 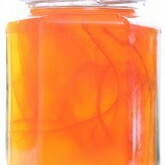 Januari 2012 update: Last year we, together with 1100 other participants, send a jar of marmalade to the Marmalade Awards in the UK. We got a merit report in the Seville orange category so we are tempted to honor the invitation we got this year and try again and do even better! We already made one batch and it turned out velvety and with a nice citrus flavor. We are making a second batch, slightly different from the first. Both batches are a combination of several recipes and our own new insights into the marmalade making process. The first day being the same as described below, the second day involves a fairly short cooking cycle with less water. We use organic Sevilles and also organic sugar. 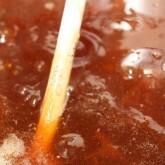 The organic sugar gives of a bit of caramel color during cooking because it is not pure white like regular caster sugar. 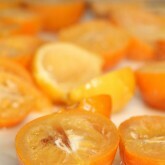 Take 1,5 kilograms of Seville oranges (make sure they are clean or scrub them first) and two unwaxed lemons. Bring to a simmer in a large preserving pan, adding the 3 liters of water. Cover the pan with aluminum foil so no steam can escape and let simmer for 3 hours. Let cool for a while and transfer the fruit from the pan into a colander over a bowl. Cut the oranges and lemons in half and scoop out the flesh and pips. 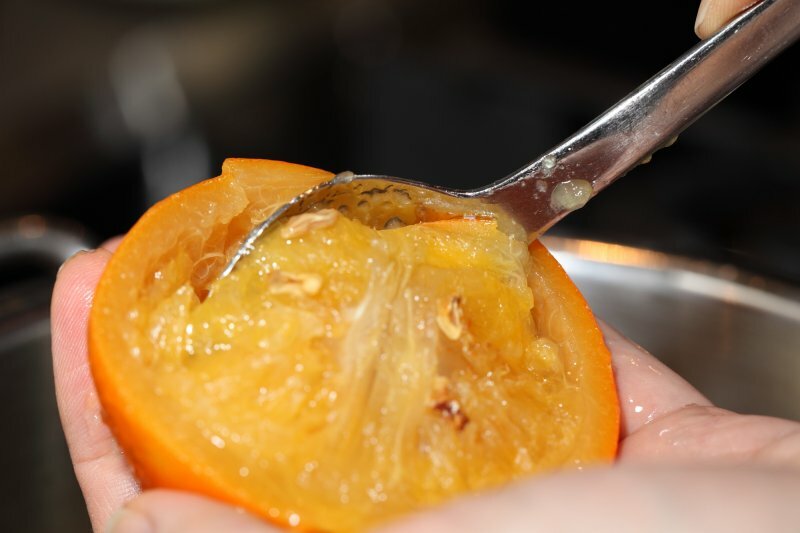 After you scooped it out, make sure you scrape your spoon along the inside of the peel again, to get all the lovely pectin still hiding in there! Keep the peel of the oranges for later use. Put flesh and pips in a saucepan with half a liter of the poaching liquid. Let simmer for 10-15 minutes. TIP! Before going to the next stage, grind the flesh and pips with a hand blender to make the straining much easier! Then strain through a sieve, lined with a muslin (very fine woven) cloth. Give it time to drip trough. In the meantime you can cut the orange peel in strips. Chunky or fine, a lot or a little, which ever you prefer. 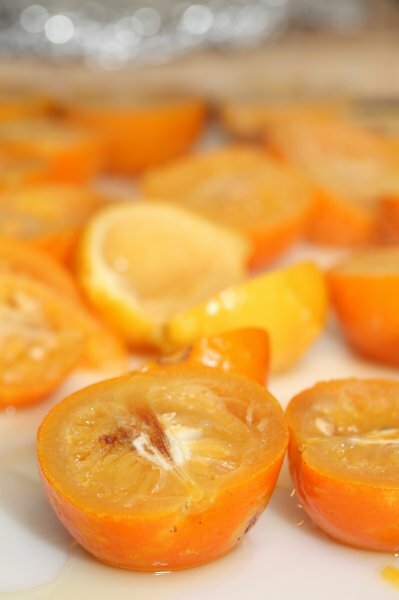 We cut the peel into fine strips and use the peel of about 2 oranges, so we have a lot of jelly and a little peel. Put them back in the preserving pan. Back to the flesh and pips. 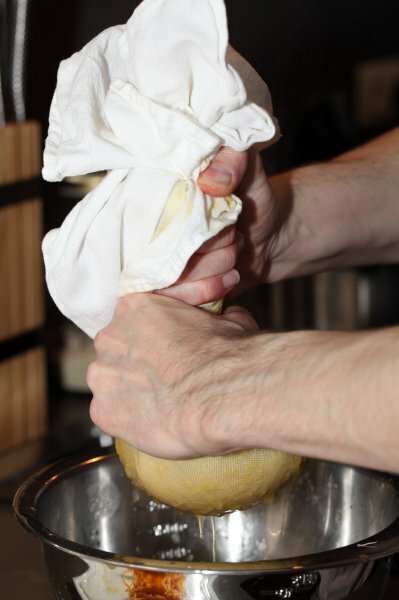 Take the muslin cloth and twist it into a ball and squeeze all of the juices into the preserving pan. The pectin in this juice will make your marmalade thick so make sure you squeeze everything out (this can take 5 to 10 minutes). Cover the preserving pan with a tea towel and leave it till tomorrow! Warm the 2.2 kilograms of sugar in a roasting tray for 10 minutes in the oven at 170°C Gently heat the preserving pan and add the warm sugar. 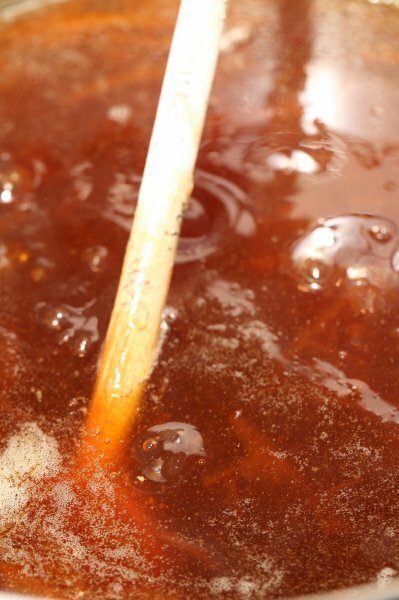 Stir with a wooden spoon, keeping the heat gentle, until you are sure all the sugar has dissolved. Now turn up the heat and let the marmalade bubble gently. This can take up to 3 hours or more, depending on the amount of pectin, your stove etc. When you think you are nearly there you can test the consistency by allowing a teaspoon of the marmalade to cool for a minute on a chilled plate in the fridge. The marmalade is ready if it crinkles when pushed back with your finger. Repeat the test every 10-15 minutes if necessary. When you are sure it’s ready leave it to cool for 30 minutes before ladling the marmalade in sterilized jars and sealing them right away. Surprisingly a lot of our friends and family (even the younger ones) are fond of marmalade, though it’s considered an acquired taste. It’s great on toast but also usable in lots of dishes, both sweet and savory, from cookies, cakes and breads to chicken, lam and ham. So, home made marmalade makes a great gift and it comes out a winner compared with many shop bought products. 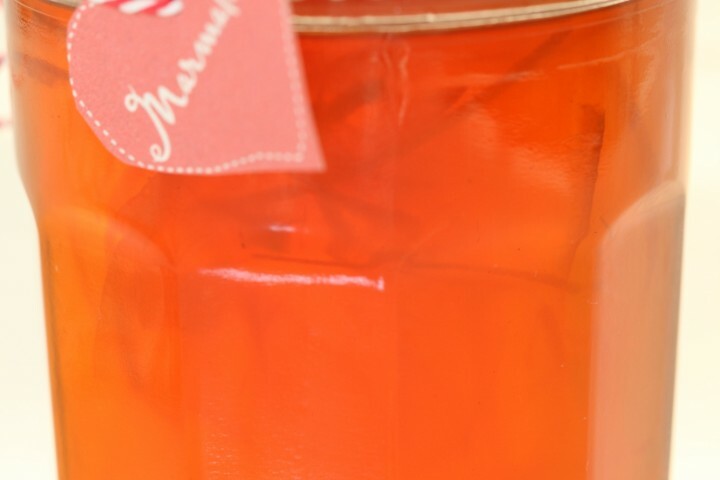 I wouldn’t be surprised if you found lots of undiscovered marmalade lovers in your family too! Tip: The Aga Maslin Pan (Jam Pan / Preserving pan) with a capacity of 8 liters, is great for making larger quantities of jam. Thanks for the addition. Yes, I think we will automatically fall into the international category. We will find out soon enough. Hope you find the time for some marmalade making too! Marmalade is of a darker quality and we like it that way but I am afraid that competition wise the jury is more in love with the lighter variety…. You could always enter one of the alternative categories – maybe mail the organizers and ask them if you automatically enter the international one and if it is any sort of marmalade? I have never entered something like this so I am no expert on competitions. My friend Gill went last year and she entered a jar in the Seville orange category and in that one they do seem to want a light colour. But there are many other categories to enter for. My oranges are waiting for my attention, sorry I haven’t started yet. Full of good intentions – that’s me. Have a good week!